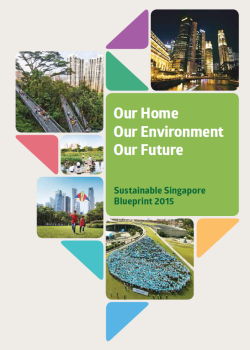 The annual Clean and Green Singapore held over the weekend saw the release of the Sustainable Singapore Blueprint 2015, which is revised and updated from the previous blueprint published in 2009. Dr Yaacob Ibrahim, Minister for the Environment and Water Resources, and Dr Amy Khor, Senior Parliamentary Secretary, Ministry of the Environment and Water Resources, gave their speeches during the Committee of Supply Debate under the Ministry of the Environment and Water Resources (MEWR). At Copenhagen, Singapore supported the Accord, and has since written to the UNFCCC Secretariat to associate ourselves formally with the Accord as a good basis for advancing negotiations towards reaching a legally binding global agreement on climate change. Though the Accord as it stands does not create legal obligations, it contains important elements that can facilitate the on-going negotiations. To date, about 100 out of the 194 Parties to the UNFCCC have associated themselves with the Accord. About 30 non-Annex I countries, including Singapore, have also tabled their emission reduction targets. To play our part in international efforts to mitigate climate change, Singapore has pledged to reduce our greenhouse gas emissions by 16% from the 2020 business-as-usual scenario. This target is contingent on a legally binding global agreement in which all countries implement their commitments in good faith. Our target is credible and rigorous given our past efforts to reduce emissions and the constraints we face as a city-state, including our limited potential to adopt renewable energy.It is a substantial commitment by Singapore. Achieving it will involve considerable costs, and changes in lifestyle and business practices. BCA will increase the mandatory minimum energy efficiency standards for Green Mark certified new buildings by 10% from today’s standards by the end of this year, and will also mandate the submission of building energy usage data from 2011. Our consultations with large energy users indicate that a wide range of energy management practices exists today. We therefore see the need for minimum standards to ensure greater management attention is paid to energy. While this will ultimately benefit companies in terms of cost-savings, we also recognise the need to give companies sufficient lead-time to prepare. By 2013, we will require companies in the industry sector consuming more than the equivalent of 15 GWh of energy each year to appoint an energy manager, monitor and report energy use to NEA, and develop and submit energy efficiency improvement plans. NEA will be consulting the companies involved on the detailed requirements. To ensure a smooth transition, NEA will introduce the Energy Efficiency National Partnership, or EENP, in April to help companies build up the necessary capabilities before the mandatory energy management practices come into effect. We will also be reviewing our incentive schemes and exploring long-term energy efficiency financing options to cater to the needs of companies. These energy management requirements for industry and energy efficiency-related legislation in other sectors will be consolidated in an Energy Conservation Act that will come into force in 2013. The Act allows for a co-ordinated approach to standards-setting for energy efficiency across all sectors, and will represent a major milestone in the government’s efforts to develop energy efficiency as a competitive advantage for Singapore. As I announced last year, minimum energy performance standards or MEPS will be implemented for household air-conditioners and refrigerators in 2011.MEPS will remove the most energy inefficient air-conditioners and refrigerators from the market. Depending on the appliance category, all 0-tick models and some 1- and 2-tick models will be removed, representing about 20% of current sales volumes. A sufficient range of brands and models will remain available for consumer choice. MEPS will help consumers save on electricity bills and is not expected to significantly increase the upfront cost of air-conditioners and refrigerators. A more efficient fridge that costs the same as one phased out by MEPS can save a household about $130 a year. When all the existing air-conditioners and refrigerators in Singapore comply with the MEPS standards, consumers will enjoy a total energy savings of about $20milannually. We will tighten the MEPS standards over time. We will also consider extending MEPS to more appliances, such as lighting and televisions. 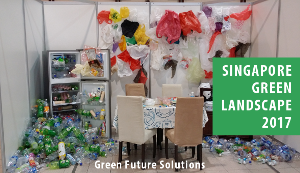 The public sector will continue to take the lead on environmental sustainability measures. From FY11, all Ministries will set energy savings targets. We will continue to study new measures that can be implemented. In 2007, NEA commissioned a study involving local and foreign experts to understand our vulnerabilities to climate change. The first phase of the study covering the physical impacts of climate change has concluded. The results have been peer reviewed by international experts who noted that the study adopted well-established methodologies and that the findings are plausible. The study projects that the average daily temperature in Singapore could increase by between 2.7 to 4.2°C from the current average of 26.8°C by 2100 and the mean sea level around Singapore could rise by 24 to 65 cm by 2100. These findings are within the range of our expectations and consistent with global projections by the Intergovernmental Panel on Climate Change. Is Singapore carbon intensive and a big contributor of carbon dioxide per capita in the world? How do we compare with other developed countries? Let’s take a look at Singapore’s total carbon dioxide emissions, carbon dioxide emissions per capita, and carbon intensity. Singapore’s total absolute CO2 emissions and CO2 emissions per capita from 1990 to 2007 is shown in the graph below, based on statistics from the Ministry of the Environment and Water Resources, the National Climate Change Strategy and the Singapore Department of Statistics. Singapore’s CO2 emissions is 39.9 Mt in 2007, which accounts for less than 0.2% of global CO2 emissions. The graph shows that Singapore’s CO2 emissions has increased about 83% from 1990 to 2007 but has remained relatively constant over the past 4 years. The CO2 emissions per capita has also reached a peak in 2004 and declined slowly. This is likely due to the switch to cleaner natural gas for power generation and other energy efficiency measures by the government. Carbon intensity is usually measured in terms of the CO2 emissions per dollar GDP at 2000 prices. A low carbon intensity means that the country is able to produce each unit of output with less CO2 emissions. The graph below shows Singapore’s carbon intensity from 1990 to 2007, based on statistics from the Ministry of the Environment and Water Resources, the National Climate Change Strategy and the Singapore Department of Statistics. Singapore’s carbon intensity is 0.17 kgCO2/2000S$ in 2007 and has dropped by about 39% from 1990 to 2007, likely due to the switch to cleaner natural gas for power generation and other energy efficiency measures. Under the Singapore Green Plan 2012, a target has been set to improve our carbon intensity by 25% from 1990 level by 2012. We have already met the target and even exceeded it. There is some dispute on whether Singapore is carbon intensive and a big contributor of CO2 per person in the world, which arises due to the different sources of energy statistics used. There are two commonly quoted sources of energy statistics – the Energy Information Administration (EIA) and the International Energy Agency (IEA). The graph below shows the CO2 emissions per capita for selected countries in 2006 based on statistics from EIA’s International Energy Statistics and IEA’s Key World Energy Statistics 2008. If the EIA data is used, the CO2 emissions per capita for Singapore is much higher than the US, other developed countries and the world average. If the IEA data is used, the CO2 emissions per capita for Singapore is lower than other developed countries such as the US, Australia and Finland. The graph below shows the carbon intensity for selected countries in 2006 based on statistics from EIA’s International Energy Statistics and IEA’s Key World Energy Statistics 2008. If the EIA data is used, the carbon intensity for Singapore is higher than the US, other developed countries and the world average. If the IEA data is used, the carbon intensity for Singapore is lower than the world average and other developed countries such as the US, Australia and Finland. The discrepancy between the EIA and IEA statistics is due to the different calculation of energy consumption. The energy consumption based on the EIA is higher as it includes marine bunkers in its calculation and as Singapore is the largest marine bunkering centre in the world, our energy consumption is thus overestimated, which in turn leads to higher CO2 emissions and carbon intensity for Singapore. On the other hand, IEA excludes marine bunkers from its calculation of energy consumption. Read the Overview of the Energy Situation in Singapore for more discussion on the discrepancy. Image credit: mjamesno; Key CO2 Contributors (2005) via National Climate Change Strategy. These three reports are essential reading for those who wish to have an overall picture of what the government is doing or plan to do on issues related to energy, climate change and the environment. There’s also another previous report worth reading – the Singapore Green Plan 2012 (2006 edition), published in Feb 2006. Singapore’s energy and climate change policies are influenced mainly by economic considerations. The government will take pragmatic and cost-effective actions to reduce emissions and adopt clean energy, as long as the actions does not affect our economic growth or add to costs greatly. About 80% of Singapore’s electricity is generated from natural gas piped from Malaysia and Indonesia. The remaining electricity is generated from fuel oil and a small percentage from diesel and refuse. The government understands that we are vulnerable to energy supply and price risks as we import all our oil and gas, and has taken steps to diversify our energy supplies. To diversify our natural gas supply, the government has decided to import Liquefied Natural Gas (LNG) and plan to have the LNG import terminal ready in 2012. This would reduce our reliance on our neighbors and increase our supply of natural gas from countries that are further from Singapore such as Australia, Qatar and Russia. In addition, the government is looking at other energy sources such as solar and biofuels, and is open to other clean energy technologies and will consider these energy technologies as and when it becomes viable for adoption. The government has identified the clean energy industry as a key growth area since Mar 2007. The clean energy industry is expected to contribute S$1.7 billion to the GDP and create 7,000 jobs by 2015. The government has put in place several initiatives and funding to attract clean energy companies to set up their operations in Singapore and create jobs, and also to encourage research and development and test-bedding in clean energy technologies. We will invest early in solar technology test-bedding projects to prepare to use solar technology on a larger scale when the cost of solar energy falls closer to that of conventional energy. HDB will implement a large-scale solar test-bed for public housing within 30 precincts islandwide, which will cost $31 million and provide 3.1 megawatts peak of solar capacity. This trial will help Singapore to implement solar technology on a larger scale when it becomes cost effective in the future. Singapore does not have a target to reduce absolute carbon dioxide emissions. Instead, Singapore has a national target to improve our carbon intensity by 25% from 1990 level by 2012 under the Singapore Green Plan 2012. We have already met the target and even exceeded it (read Singapore’s Carbon Dioxide Emissions Per Capita and Carbon Intensity). Singapore’s key strategy to reduce carbon dioxide emissions is to be more energy efficient. The Sustainable Development Blueprint sets a target to reduce our energy intensity (per dollar GDP) by 20% from 2005 levels by 2020, and by 35% from 2005 levels by 2030. To help Singapore meet the targets, the Energy Efficiency Programme Office (E2PO) is promoting energy efficiency in the various sectors through the Energy Efficient Singapore policies and measures (read the Overview of the Energy Situation in Singapore). Image credit: garytamin; Energy Policy Group via National Energy Policy Report.